Why theater? : When I was young, I actually wanted to be a recording artist. I'd run around with my record player (yep) and sing everything from Stevie Wonder, to Earth Wind and Fire to Willie Colon. However, coming from a conservative Latin family, their encouragement was toward a financially secure job and life. Hence, I went into Banking. I worked in Banking for years and began doing some theatre on the side and realized how much it fed me. How it reignited my passion of singing. To create characters with depth and feelings that had to sing was a almost an exact parallel to how I felt at times in my own life. So....I quit Banking and began my true life in pursuit of the theatre. Tell us about Zapata: Zapata is based on the Mexican Revolutionary that fought on behalf of the people to regain their lands taken from the corrupt government of the time. Its definitely a story that directly correlates to the struggles that our world is facing now. The struggles for Equality, for Children's rights, for Hunger. Its amazing how the past still informs our present. It's message is definitely spoken in one of the lyrics the wonderful Natalie Toro sings in one of her songs: " We must fight for what we LOVE, not for what we Hate". What is it like being a part of Zapata? : This is my first NYMF experience. I have been blessed to have been working for these past few years and so I never had this opportunity before. I'm thrilled to be part of this festival and Zapata. We have an wonderful and loving cast full of Latin people! YESSSS! Doesn't happen very often in mainstream theatre as we all know. So we are working for very diligently to make this story as relevant and as good as it can be. What kind of theater speaks to you? What or who inspires you as an artist? : Well, I made myself a promise that if I could maneuver my career (as much as we can control it), I would like to always work on new projects. Ive been very fortunate to be able to do a lot of that thus far. In the Heights, Leap of Faith, Little Miss Sunshine to name a few. Theatre can be a reflection of the times and can also provoke conversation. I love when theatre can push the audiences button in some capacity. To me, that's whats most thrilling. So many things inspire me. But one of the most important things is to be able to see myself onstage. To see Hispanic performers on a Broadway stage inspires so much of what, to some, may not be possible. Growing up we had Chita Rivera, Rita Moreno, Raul Julia. We could name them. Unfortunately, that is still somewhat the case. Doing In the Heights opened the door for such a diverse group of people to be represented not only onstage but in the audience. Maybe someone who saw the show will be inspired to pursue their dreams in theatre. We need more performers of color to step into the front lines. Not only as performers, but as writers, composers, directors, choreographers and producers of Broadway theatre. Any roles you’re dying to play? 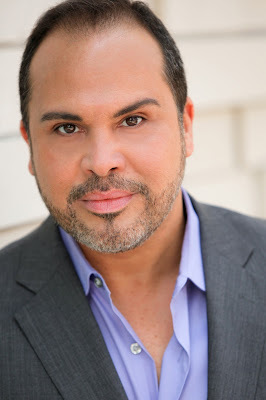 : Ive been pretty fortunate to have played some of my favorite roles such as Judas and Che Guevara and Kevin Rosario. I would have loved to play Aldolpho in Drowsy Chaperone. But what I'd love to do is to work on a play. It seems to be a difficult task in this town to move back and forth from musicals to plays. Very few are given that option. I don't really know why. But I'd love to create a character in a play. Maybe a darker, layered character would be fun! What’s your favorite showtune? : Wow....that's tough. I'd say there are two: "Somewhere" from West Side Story and "Move On" from Sunday in the Park. If you could work with anyone you’ve yet to work with, who would it be? : That's easy: GEORGE WOLF I have always wanted to be directed by him. I find him to be such a smart, enlightened, creative director. I have several friends who have worked with him and they've all confirmed my beliefs. I almost had the opportunity when I was up for A Free Man of Color.....obviously, I didn't get it. I will still claim it: I WILL WORK WITH GEORGE WOLF! Who would play you in a movie about yourself and what would it be called? : Who else would play me, but me. C'mon. OK, if I can't play me, then I'd like John Leguizamo to play me in the movie titled: " Todo es Posible" or "Anything is Possible"! What show have you recommended to your friends? : Once and Peter and the Starcatcher. Both: AMAHZING! What’s the best advice you can give someone trying to make it in theater? : Anything is possible if you have faith in yourself, your talent and perseverance. Also, always be PREPARED when you audition. Know the material, make your choices and LIVE the audition. Leave it all in the room so that when you leave, you know you did everything you could have done. Then release it all. My motto: Onward and Upward.